Frontier Appalachian Trail Corn Bread is the world's best corn bread mix that makes an 8x8 inch square pan or use a muffin tin and fill a basket with delicious corn muffins for any meal. For breakfast we like to split the cornbread square in half and spread with butter and warm syrup. Serve this delicious corn bread with soup for supper or with butter and hot syrup for breakfast. Melt butter in 8x8 pan in oven - butter may turn brown. Then, swirl butter in pan to coat bottom and sides. 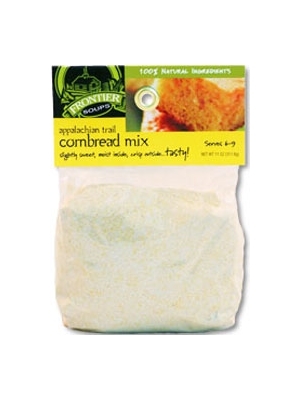 Add contents of cornbread mix and stir thoroughly. Pour mixture into preheated pan. Blend eggs and buttermilk. Add contents of corn bread package. Stir in corn, cheese, green chilies or seasonings. Melt butter in 9 x 13 inch pan in preheated oven. Swirl the butter to coat the pan, then add melted butter to the batter and stir. Pour batter into pan and bake 18 to 20 minutes at 425 degrees.